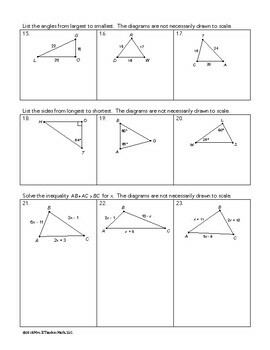 This NO PREP lesson teaches students about the Triangle Inequality Theorem. 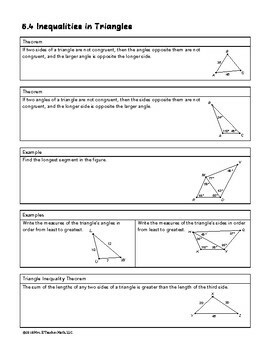 This FULL LESSON is a great addition to your relationships in triangles unit. Differentiation included! 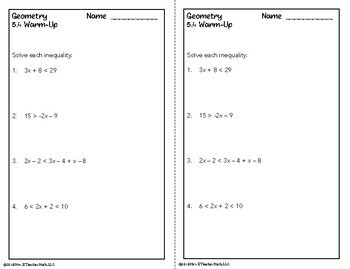 Warm-Up - The warm-up is a review of solving inequalities. Guided Notes - Two versions are included: mostly complete and fill-in-the-blank. The notes are 1.5 pages long. Examples are included throughout. Homework - The homework is 2 pages. Answer Keys - Completely worked out answer keys are included. 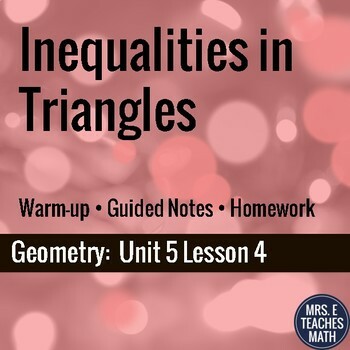 Make sure this lesson is appropriate for your students - see the preview to see some of the pages in the product. This is a lesson from Unit 5 - Relationships in Triangles Unit in my Geometry curriculum. Be the first to know about my new products, freebies, and discounts! Look for the green star near the top of any page within my store and click it to become a follower. You will then receive customized email updates about my store. This purchase is for one teacher only. Purchasing this product grants permission for use by one teacher in his or her own classroom. This item is bound by copyright laws and redistributing, editing, selling, or posting this item (or any part thereof) on the Internet are all strictly forbidden. If you wish to share with colleagues, please purchase additional licenses.